Probably one of the best things that has happened to me as a result of managing the Mind Body Spirit Marketplace on 1000 Markets, is being continually exposed to such a wide variety of amazing artists and craft people. I know I say that over and over...but it's really true. For quite awhile now I had been witnessing a very enjoyable parade of work from artist PattyMara Gourley come in and go out of the marketplace. PattyMara is a very lively, vibrant, inspirational California/New Mexico artist who expresses herself quite skillfully through a wide variety of mediums. Silk painting, poetry, collage and ceramics to just name a few. I think in over the year's time I had seen her make little of everything, except teapots. So I emailed her one day and asked her about it. 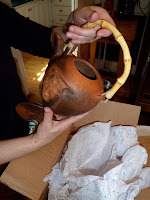 My husband and I have collected teapots on and off for years going back to when I taught art classes at Craft Alliance Center for the Visual Arts in St. Louis, and somehow got talked into becoming a docent for one of their International Teapot Shows. I learned more about teapots during that time period then anyone ever needs to know during their lifetime, but also developed a deep appreciation for the art form as a unique style of individual expression. PattyMara got back to me. Yes, she did make teapots but had not done so in a long time. OK, that's fine...but I told her if she ever got around to making them again in the future, let me know. 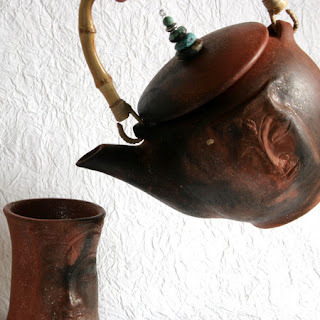 I honestly thought that was the end of it until I saw a posting from her on Facebook one day that she was doing some new ceramic work, and among the pieces...teapots. OK, I thought... I was going to have to keep an eye on her. The story then took a couple of interesting, creative turns. 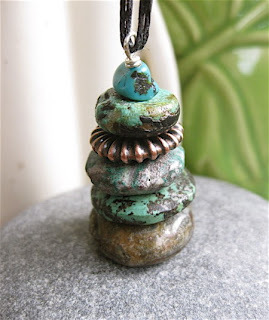 Some time passed and I read (again on Facebook) that PattyMara was coming along very well on her teapots and had evidently commissioned our mutual friend Manny, who designs jewelry (Mannybeads), to make some cairn stacks that she was going use on the pieces. humm I was trying to visualize that....(without success). In fact every time I tried to even imagine what a PattyMara teapot would even look like, I just had no idea. Knowing her it would probably end up pink and purple *with stars* and I had no clue how Manny was going to fit into it all. Tease pictures of the teapots in process were eventually posted. The Buddha faced pot that I saw reached out and touched my soul. Hey Patty, I wrote...I'd be really interested in that Buddha Teapot when you get it finished.... OK, was the reply....I'll email you before I list them. I never heard back from her. Well the pots were eventually listed online for sale. They were not pink or purple, but instead a beautiful earthenware color that comes from the New Mexico Mica Clay that PattyMara uses for her ceramic work. Manny's turquoise cairn stack complimented the top of the Buddha teapot perfectly. The 2nd teapot PattyMara constructed was every bit as lovely. No Buddha face, but another wonderful cairn stack and recycled silk threads from an old sari that had been wrapped around some bamboo for the handle. In passing one evening I logged into 1000 Markets and showed my husband, Alan, the teapots. I mentioned how much I liked them and I thought that maybe one would make a nice addition to our collection. He liked both of them but really thought the pot with the wrapped handle was pretty unique. Of course I couldn't get past the Buddha face. Alan said he really didn't care which one we got, he liked them both....so my choice. I said I would give it some thought and then...completely forgot about it. A week or two later I saw PattyMara's announcement on her Facebook Fan Page. The Buddha pot had sold. Well crap, I thought. After all this, I really blew that opportunity. Our Anniversary happened to be coming up and a few days later my husband told me that a package would be arriving soon...not to open it. 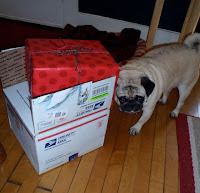 I was honestly kind of surprised that he even thought about ordering a gift, but once again I forgot about it (eye roll)...until it arrived... humm....from PattyMara Gorley. Alan put the delivery on the table in the living room and it stayed there for a good week. 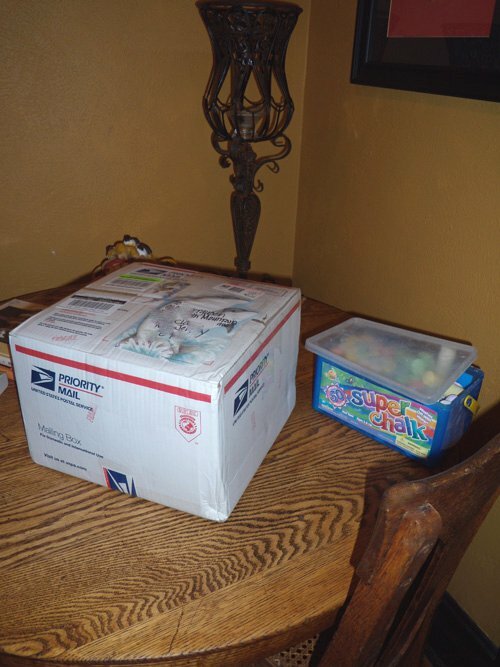 When I asked about the package, his response was...."what package?". At one point I even posted on my Facebook page about the package. What could it be? Everyone was begging me to open it. Of course I was already about 99% sure what it was, and although I was dying to see it...I let it sit. Buddy and I opened the package with the wonderful Buddha teapot on my anniversary. Buddy, one of our 3 Pugs, likes to be involved when any delivery boxes are opened (ever since someone sent him a sample of Bark-Scotti a few months ago). The teapot is even more stunning in person then in the pictures. The construction very solid, the Buddha face even more poignant. I can tell it comes from a very well seasoned, experienced potter. "I have found inspiration for this teapot from the Yixing tradition of China's Sung Dynasty, which also uses unglazed, burnished clay with a high mica content. In the strict Yixing tradition only one variety of tea is used for each pot so that after a time, one can just add hot water to brew tea from the accumulated flavoring." Eventually Alan and I will make tea in the pot. We need to settle on one particular variety though so that we can continue the tradition. For now, I think I'm going to let this special teapot spend some time with me in my studio. Something tells me that it has already formed a cross cultural kinship with Kenny Scharf's three eyed dog, Dogeyeguy...my Matryoshkas, Tibetan bell and of course the Milagro Crosses. And I wouldn't expect anything less from a PattyMara piece of art! What a wonderful story about how far an artist's touch can reach... And how great sites like 1000markets and facebook are for finding those wonderful artists!! Oh, Diane, I am speechless. What a treat to read about my work from your perspective! As our friend Leinaala would say, your words make a nest in my heart, where I can curl up inside their soft glow. Thank you. There is no greater joy than to see my work in the home and studio of a sister artist on the path. Diane what a wonderful post! This pot must have been meant for you before the clay was even on the wheel...Beautiful words, beautiful story. I am so touched and honored. 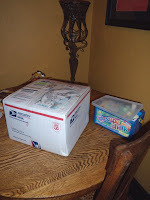 Thank you, Diane...and honestly, I almost slipped in that second handle (the fiber wrapped one) into the box before I mailed it to your husband. It could still happen!